Food and drink are always high on my list of holiday priorities; up there with slapping on the sun protection, scuba diving and climbing centuries-old towers to take panoramic snaps of the rooftops. Inevitably I’ve returned from a few days in Dubrovnik’s Old Town with a taste for Croatian lager (Ozujsko or Karlovacko bottled and draught). 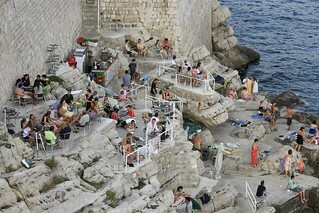 I’ve also got recommendations for the best Bosnian restaurant in town (Taj Mahal, details below), that serves the gooiest baklava I’ve ever mooned over; and a no-frills bar (called Buza 1, more below) built onto the rocks, where you can dive into the famously clear blue water of the Adriatic in-between cocktails. Prices in Dubrovnik were the steepest I came across in Croatia’s Dalmatian region, as you’re usually paying more for the ambiance of the medieval walled-city than for the quality of the cuisine. 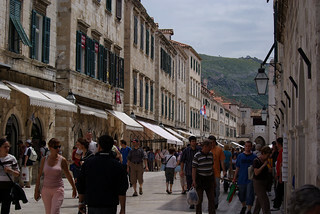 But, with a generous budget and a liking for celeb-style hangouts you could dine within the famous battlements at Gil’s [http://gilsdubrovnik.com/1index.php] – a smart French restaurant that’s housed in the Old Town walls and overlooks the harbour. Or you could book a table at Proto [http://www.esculap-teo.hr/esculap_teo.html], a landmark seafood restaurant fit for an abdicating king of England – Edward VIII wined and dined Wallis Simpson right there. 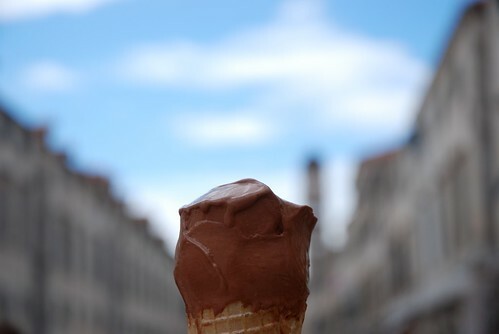 1) Italian refreshments are ubiquitous – Ice-cream lovers will love late night visits to the gelato bars that are tucked away on the Old Town’s side streets. After dinner you can sip espressos on the marble-paved promenades while swallows zip around overhead. Snacking on pizza is always an option – choose from dozens of pizzerias or pizza-slice kiosks. 2) Day-trippers flock to the obvious places – During the day an influx of guests, from the mammoth cruise ships that moor offshore, head straight for the attractive cafés in Placa Stradun, the Old Town’s main square. So why not take a wander off on your own, into the maze of cobbled streets, where quieter, cheaper and often more authentic Dalmatian food and drink can be had. 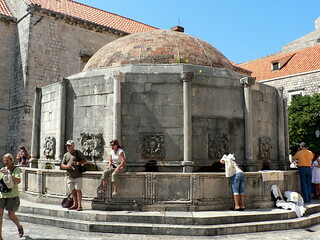 3) Drink for free from historical water fountains – Summer days in Croatia are seriously hot, so it’s worth knowing you can quench your thirst for free by filling your water bottle at one of the ornate fountains dotted around the town. Sightsee and sup at the same time, at the Onofrio fountain. This 500-year-old construction supplied residents with drinking water in 1991 during the bombardments. Visitors should suffer no ill effects from drinking local water. 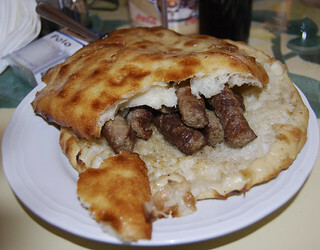 4) A taste of Sarajevo – The restaurant with the longest queue in town is still Taj Mahal [http://www.tajmahaldubrovnik.com]. Their friendly staff ply two rows of outdoor seating with cevapi (grilled meat fingers in flatbread with sour cream and onions) and much more, from a vast menu of authentic dishes straight from Sarajevo, in neighbouring Bosnia and Herzegovina. Their Bosnian coffee is strong and their baklava big enough to share – but keep its flaky, nutty sweetness all to yourself if you can. Book a table in advance to avoid a long wait. Address: Nikole Guceticeva 2. 5) Buza 1 – This laid back, no-frills bar with simple bistro tables and mellow music, serves spirits, soft drinks and bottled beers to a stream of sun-worshippers. It has great views of Lokrum island and plenty of space to jump off the rocks into the Adriatic. Head straight here to strip off, cool down and chill out after you’ve traipsed around the city walls. Buza 2, further along the walls, is a smarter affair with parasols. They’re both marked on tourist maps; just follow the city walls at street level, looking out for a door in the wall and a graffiti sign on the stones that reads “no nudists”. 6) Happy hours for the budget conscious – Early evening is the best time for cocktails and beers in Buniceva Square, behind the cathedral where the best-known bars are huddled. After 7pm prices for a pint of local beer in this drinking hub verge on the exorbitant.